Yellow Tail is sold on the Super Bowl. For the third consecutive year, the Australian winery will join other big national brands in advertising in the big game, but, unlike the others, it will do so without buying any network time from CBS. Because Anheuser-Busch is the exclusive alcohol advertiser in the network telecast, Yellow Tail will reach 90% of homes by cobbling together local time on the CBS O&Os and affiliates in a combined 81 markets. Yellow Tail expects the network end run to be well worth it as it has been in the past. The brand achieved a 5% increase in sales in February 2018 following its Super Bowl appearance last year, which it sustained throughout the year. And that was on top of an 8% increase throughout 2017 following its 2017 Super Bowl multi-market buy. But despite Yellow Tail’s success, other national advertisers are not following its lead. While Anheuser-Busch is using its national exclusivity to the max this year, running eight spots for five of its brands in the network Super Bowl telecast, no major beer brands are making significant buys locally. One buyer says with A-B running so many spots and soaking up all the publicity about their spots heading into the Big Game, competing beer advertisers would rather not spend the money on creative for local spots only to be overshadowed by A-B’s national spots. Ditto for the automakers. While several are in the national Super Bowl telecast, few will run across multiple local markets. According to major TV sports buyers, a big factor discouraging national advertisers from buying local time is the cost of coming up with a buzz-worthy spot. The advertisers don’t want to spend $1 million for creative on a spot that will not air across the entire country. Vanity also has a lot to do with it, the buyers say. Advertisers don’t want to appear like they are advertising locally to save money, one buyer says. And if they are spending big bucks on creative, they want to give their ads the best chance of being noticed. 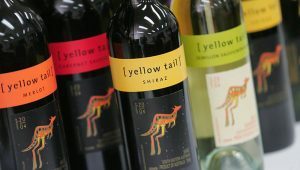 Iain Douglas, chief marketing office of Deutsch Family Wine & Spirits, the U.S. marketer of Yellow Tail, acknowledges that it will spend more with its piecemeal buy than it would have if it could have made a network buy. CBS stations do not lament the loss of national money as they have no trouble selling their time to local or regional advertisers at a premium. The buyers are usually a mix of their top-10 advertisers, says a rep. According to the buyers, WCBS New York was asking around $800,000 per local Super Bowl unit. While at one of CBS’s smallest affiliates, buyers say advertisers could get an in-game Super Bowl unit for as low as $400. This year’s host city is Atlanta and local in-game Super Bowl spots on Meredith’s CBS affiliate WGCL there are said to be going for about $100,000, according to agency buyers. Nexstar CBS affiliate WIVB Buffalo, N.Y., which drew the largest local market Super Bowl rating last year, edging out the two Super Bowl team markets of Philadelphia and Boston, reportedly is selling local spots for $55,000. Yellow Tail would not discuss local Super Bowl commercial pricing nor would CBS or the national station reps. While Yellow Tail also would not discuss production costs for its Super Bowl spot, the brand seems to be sparing no expense. It features 22 actors and 44 extras and was directed by feature film, music video and commercial director Jeffrey Darling, and was shot in Miami. The spot will launch Yellow Tail’s new “Tastes Like Happy” campaign that was created working with a new agency for the brand, BAM Connection. Deutsch’s Douglas says BAM’s chief creative officer, Rob Baiocco, has created multiple Super Bowl ads in past years. The new Yellow Tail spot features two entirely fan-produced video segments following a contest in November that asked consumers to share videos showing what makes them happy. Douglas says more than 1,500 fan videos were submitted to the Yellow Tail website and social media pages and the two best were picked for the final spot. Yellow Tail has awarded an all-expense paid trip to anywhere in the world to the winners. Yellow Tail’s goal across all the markets was to schedule their spots as close to the end of the second quarter and halftime as possible. In many instances, Spots were bought months in advance of the Super Bowl and spot prices were subject to last-minute increases in Boston and Los Angeles after their teams earned a place in the game on Jan. 20. The network end run may not work for other national advertisers, but it does for Yellow Tail. It will keep doing it for “the foreseeable future,” says Douglas.